If you choose to install and use the PowerShell locally, this tutorial requires the Azure PowerShell module. Run Get-Module -ListAvailable Az to find the version. If you need to upgrade, see Install Azure PowerShell module. If you are running PowerShell locally, you also need to run Connect-AzAccount to create a connection with Azure. Now that you have a resource group, you can run a container in Azure. To create a container instance with Azure PowerShell, provide a resource group name, container instance name, and Docker container image to the New-AzContainerGroup cmdlet. In this quickstart, you use the public mcr.microsoft.com/windows/servercore/iis:nanoserver image. 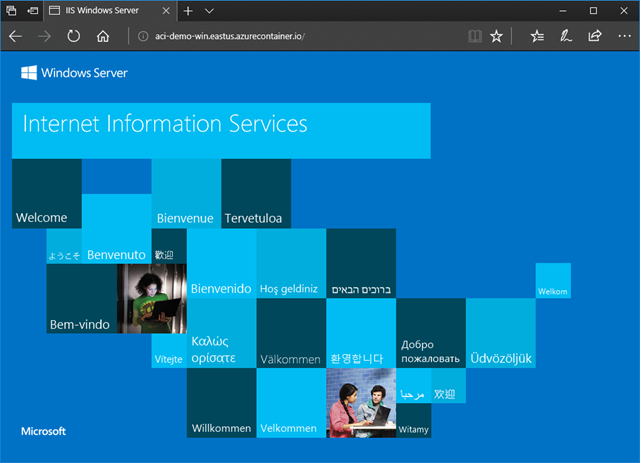 This image packages Microsoft Internet Information Services (IIS) to run in Nano Server. You can expose your containers to the internet by specifying one or more ports to open, a DNS name label, or both. In this quickstart, you deploy a container with a DNS name label so that IIS is publicly reachable. Execute a command similar to the following to start a container instance. Set a -DnsNameLabel value that's unique within the Azure region where you create the instance. If you receive a "DNS name label not available" error message, try a different DNS name label. Once the container's ProvisioningState is Succeeded, navigate to its Fqdn in your browser. If you see a web page similar to the following, congratulations! You've successfully deployed an application running in a Docker container to Azure. In this quickstart, you created an Azure container instance from an image in the public Docker Hub registry. If you'd like to build a container image and deploy it from a private Azure container registry, continue to the Azure Container Instances tutorial.